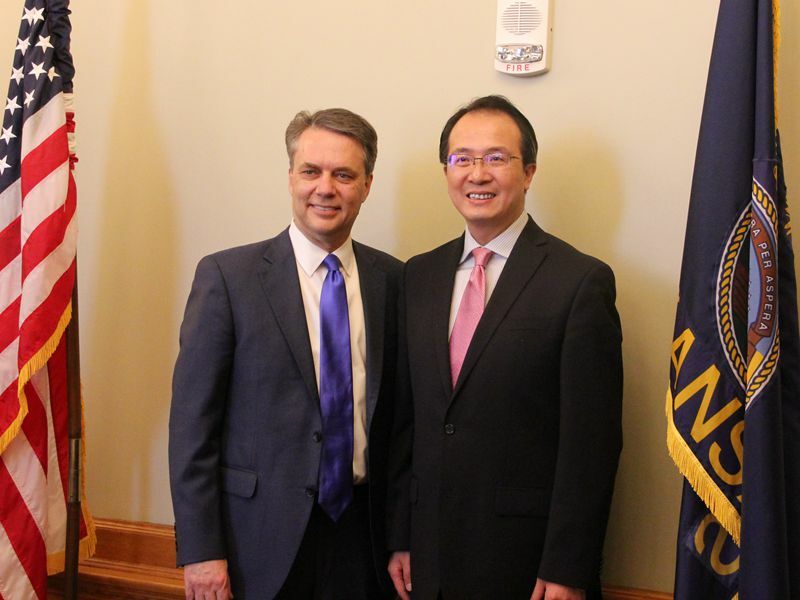 On May 10, 2018, Consul General Hong Lei met with Kansas Governor Jeff Colyer at the Capitol building in Topeka,capital of the State of Kansas. Consul General Hong Lei briefed Governor Colyer on the exchanges and cooperation between China and Kansas. He stated that China is Kansas’s third largest trading partner, with the two sides having a broad prospect for cooperation in the manufacturing and agriculture sectors. A large number of Chinese students are currently studying in Kansas universities. These students will play important roles in strengthening the China-Kansas relations and enhancing mutual understanding between China and Kansas. China will continue to deepen reforms and open wider to the outside world. We hope that Kansas will seize the tremendous opportunities brought about by China’s development, further strengthen exchanges and cooperation with relevant provinces and cities in China in fields such as economy, trade and people-to-people exchanges, so as to achieve mutually beneficial and win-win results. Governor Colyer said that the friendly and cooperative relations between Kansas and China have maintained sound momentum in recent years. The exchanges and cooperation between the two sides in various fields have boosted the local economic and social development. Kansas enjoys an advantageous geographical location, convenient transportation and numerous business opportunities. Kansas welcomes more investment from Chinese companies. The State Government of Kansas attaches great importance to its relationship with China and is willing to continue to deepen exchanges and cooperation in economy, trade, people-to-people exchanges and other fields.